Are you perplexed having being penalized by Google? Do you want to know the tricks to get your Google rankings back? Previously the ranking of a website in Google depended on the number of links it had. However, Google now focuses on the quality rather than the quantity. And, sites that are penalized usually do not have quality links. 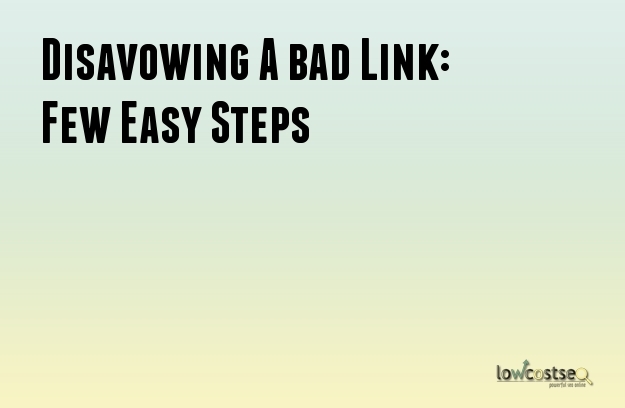 If you want to recover and get your ranking back by discarding the links then you need to follows these steps. The first step of low quality link removal is identifying the source from which the penalty originated. You can choose to go through your links manually or through the various tools. In this case Google will send a notification through the Webmaster tool. The type of penalty that has been levied will determine the type of steps you have to take up to come out of it. You can also take the help of different types of tools that are available for download in order to classify the penalty. You are required to have list of the links that are there on your website. The list has to be a complete and updated one. The links can be acquired by downloading it through the Google Webmaster Tool. However, it is better to use the special SEO software for formulating the list. Or else you incur the risk of developing a list of links that is completely inaccurate. You will again have to take up responsibility of allotting time for auditing the links. This at times may not even make a difference. The links that are recognized has to be classified accordingly. There are two categories of links to be put into. One category is the compliant category and the other category is the non-compliant category. Each and every link in the spreadsheet should be classified according to this. The links which do not follow the required guidelines come under the category of non-compliant links. Referring to the guidelines of Google Webmaster you can find out such links. After you have obtained the links that do not abide by the guidelines, the next step that you are required to take is to acquire all kinds of information about the link. The details can be obtained from the Webmaster. They will provide you with the information which will help you to remove the link from your webpage. You should always check via this tool before you discard a link. Otherwise you may end up disavowing a wrong link. When you do not receive kind of information about a particular link make sure you put it under the disavowing list. When you are done with all the procedure all you have to do is to upload the list of disavowed links in the Webmaster tools. When a certain link has been disavowed it generally means that Google will no more recognize the particular link as a part of the PageRank. Follow the steps for every link that is present in your website. It can take a substantial amount of time but that should stop you from securing your website.